Need a quick, delicious, but healthier football food for this weekend? Try out this easy & oh-so-yummy dip! You can serve it with chips, or I cut up whole wheat tortillas into football shapes & baked them w/ a little salt. Either way, you'll see this disappear before you can say "Touchdown!" Preheat oven to 400 degrees. Mix Black Beans, Great Northern Beans, Corn, Red Salsa, and shredded cheese in a large bowl. Spread in a 9 x 13 pan sprayed with cooking spray. Bake at 400 degrees for 15 minutes until warm and bubbly. Remove from oven and let set for 5 minutes. While dip is baking, place a stack of tortillas on a cutting board and cut out football shapes. Spread on a greased cookie sheet and spray tops with cooking spray. Sprinkle sea salt on top. Bake in a 400 degree oven for 5 minutes until crispy. After dip has cooled for 5 minutes and set a little bit, gently spread Pace Tequila Lime Salsa over the top. In a gallon ziploc freezer baggie, mix cream cheese and sour cream. Snip an end off the bag and pipe on yard lines and hash marks. If the mixture is too thick to pipe out, add a little more sour cream. Hike! Ever since I made Edible Crayons last Valentine's Day, they've been a staple around here. They're so easy to make and look so cute--the kids (and adults) love them! So, we made a few to keep "score" this weekend...can you tell who we're rooting for? :) Don't worry, I made labels for you Cardinal fans, too. Simply print on colored paper (not cardstock, it's too hard to roll around the pretzels), cut, and wrap. These are honestly so easy, my 4 year old makes them all the time and they look great! Click here for Edible Crayon instructions. Download crayon labels for the Steelers here. Download crayon labels for the Cardinals here. We've all had cheesey chili-dips at football parties, why not stir things up a bit and make a Fun Fondue with all the fixins'? Preheat oven to 400 degrees. Cut Velveeta in chunks and place in medium saucepan with garlic, apple juice, pepper, paprika, and 1 T. green onion (reserve the rest of the onion for garnish). Cook over medium heat, stirring occasionally, until cheese is melted. While fondue is cooking, lay out whole wheat bread on cutting board and cut into football shapes (2 footballs per slice). Place on a cookie sheet and place american cheese or string cheese on top to make "laces". Bake at 400 until cheese is melted and bread is toasted. Place fondue in a bowl and garnish with remaining green onion. 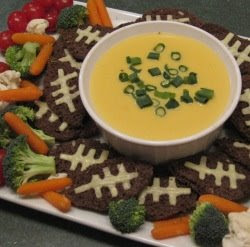 Place "football toast" and cut up vegetables around the bowl and serve! It's Superbowl Time! You still have time to enter The Recipe Girl's or Peanut Butter and Julie's Superbowl Recipe Smackdown! Pick your favorite and give a shot! Both sites are great, by the way, if you need some fun cooking ideas. When feeding a crowd, I look for three things: Cheap, Easy, and Delicious. 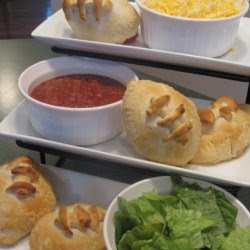 I created these fun pockets that are a snap to whip up for any football game. Enjoy! Preheat oven to 400 degrees. Brown ground beef in a medium skillet. Add taco seasoning and water as directed on package. Cook as directed. Remove from heat. On a cutting board, place 2 biscuits together and roll out into an oval with a rolling pin. Repeat with another 2 biscuits. Place a spoonful of taco meat and a spoonful of shredded cheese on one of the rolled out biscuits and place the other oval on top. Using a fork, press around edges to seal. Take a sharp knife and cut out a football shape. Make "laces" on top of the football with the scraps (see video tutorial). Bake on a greased cookie sheet for 8-12 minutes until done. Serve up with your favorite taco fixins'. Sometimes the kids (and adults!) need a little something to keep their hands busy during a football game. How about some good ol' fashioned taffy? It's super-easy to make. You can color it your team's colors and send it home as a souvenir treat! Yum! Place sugar, corn syrup, water, and salt into a medium saucepan and mix well with a wooden spoon. Place over low heat until sugar has dissolved, stirring continuously. Increase the heat and do not stir during the rest of the cooking. Wash the sides of the pan with a brush dipped in water, using an upward motion. This will prevent the formation of crystals which might cause the candy to sugar. After the syrup boils put in the candy thermometer, and when the thermometer registers 265 degrees, remove candy from heat. If you don't have a candy thermometer, you'll know it's done when you drop a little bit into cold water and it becomes brittle. Remove from heat, add 2 tablespoons butter and stir very gently. Divide into however many flavors you want to make and set aside until it's cool enough to handle. Now for the taffy pulling! Grease hands generously with a stick of unsalted butter to prevent the fresh taffy from sticking to fingers. (you can use cooking spray but it doesn't taste as good)Instruct your taffy pullers to use only their fingertips to lift the edges of the warm, flowing candy up, and then to pull out about 12 inches. Then, they’ll quickly fold the taffy back from the one hand to the other, catching the center, and then pulling again. 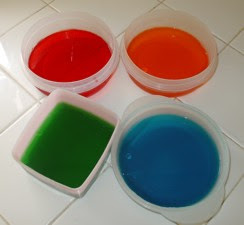 If you’re adding food coloring and flavoring, pause briefly after a few pulls to add a drop or two to the mixture, folding the mixture over on the color and flavor. Any food coloring will do and any flavoring oils you want (we like peppermint and raspberry). 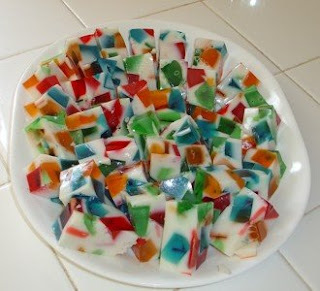 When your taffy is very hard to pull and holds its shape when laid out on a platter, it’s ready to cut into pieces. Rub a pair of kitchen scissors with unsalted butter, and then cut the hardened taffy into bite-size pieces. Wrap in squares of plastic wrap or wax paper. Or, just place on a platter and serve them up! Enjoy! 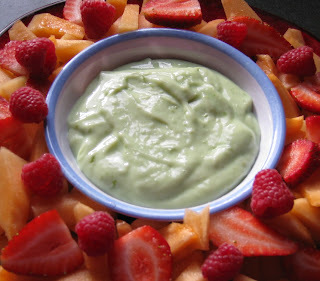 This fruit dip is FABULOUS, I've tried all different kinds and this one is definitely our favorite. It is SO EASY and it's my "go-to recipe" for get-togethers. Enjoy! Using fine grater, scrape the zest from two of the limes. Place in a bowl. Squeeze juice from all three limes into bowl. Add can of sweetened condensed milk. Add one drop green food coloring (optional--it just looks nice:)) and stir well. Refrigerate at least one hour until set. Serve with your favorite fresh fruit and enjoy! I am so excited! We're giving away amazing English Toffee for your sweetie (or yourself) in time for Valentines Day! 1) I am a toffee junkie. I adore it, it's probably my favorite treat and has been since I was a kid. 2) I've never been able to make it very well. I've gotten plenty of tips from Grandma (professional candy maker) and Mom (daughter of professional candy maker) but I can't seem to get it right. It frustrates me to no end. Fortunately, I DO know people who make great toffee (it's all about who you know, right? :)) and they're giving a bunch away to you! How cool is that? So, let me introduce you to English Toffee Anytime. 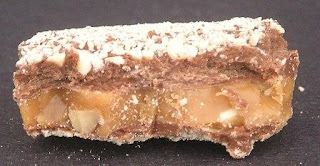 Buttery almond toffee covered with pure Guittard chocolate and coated with the finest chopped almonds. It has no preservatives and is honestly the most heavenly toffee I've ever had. 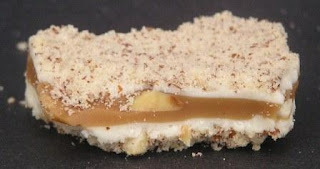 Here are the juicy details and how to win your free toffee! On February 3rd, we'll randomly pick seven winners! Respond with your address by Feb. 5 and they guarantee they can get you your toffee by V-Day. 3rd prizes – 5 third prizes of the Triple Taste-The-Toffee sampler shipped to the winners. --A complimentary Valentine card with a personal message. This offer is expires at the close of the contest/giveaway and may not be combined with any other discount or offer. One more contest detail: They can only ship to addresses within the continental United States, sometimes called the ‘lower 48’ and due to customs restrictions, they do not ship to military APO and FPO addresses. Jenn over at Just Jenn Recipes was cool enough to share this. I've been looking for a good "J" snack for school next week. I think we've found it! Thanks for sharing, Jenn!! Different color themes would be really fun depending on what you're making this for. What little princess wouldn't love purple & pink "jeweled jello" at a party? Or, how about Superbowl team colors? :) Go Steelers! 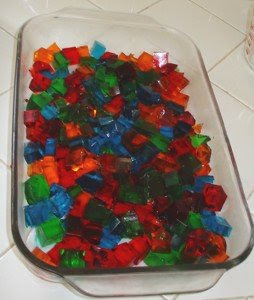 Dissolve each box of jello separately, into one cup of hot water. Pour into individual containers (small tupperware works well) and chill overnight. 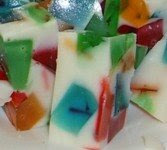 Cut flavors of jello into small blocks. Mix together carefully in pan. In a separate bowl, dissolve 2 envelopes unflavored gelatin in 1/4 cup cold water. Add dissolved gelatin to 1 3/4 cup hot water and condensed milk. Cool. 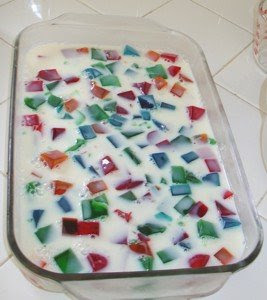 Pour cooled milk mixture over jello and chill overnight. 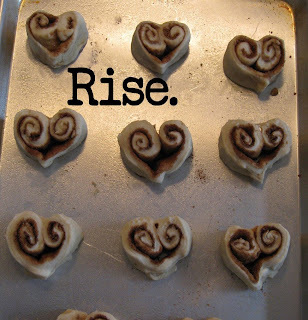 Nothing says lovin' like warm cinnamon rolls from the oven! 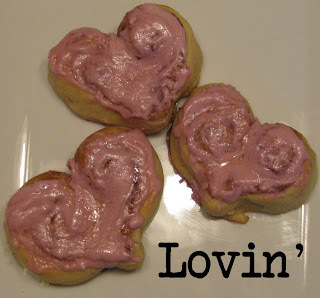 How about some luscious easy-as-pie heart-shaped cinnamon rolls for your sweetie this Valentines Day? Yum! You can use any cinnamon roll recipe you want--you can even grab a loaf of frozen Rhodes bread dough if you really want to make it easy. Mix dry ingredients together in a large mixing bowl. Add 1 egg to flour mixture along with warmed liquid from sauce pan. Beat it for 30 sec. on low speed, followed by 3 minutes on medium speed. By hand, gradually stir in 4-5 cups of flour to make a soft dough. Kneed it on a floured surface until smooth and elastic, about 1 minute. 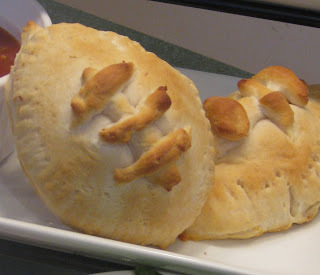 After kneeding let it rise covered in a warm place until doubled (45-60 minutes). Punch down dough. Separate dough into two equal portions. Roll out to form two large squares (about 9 x 11 inches). 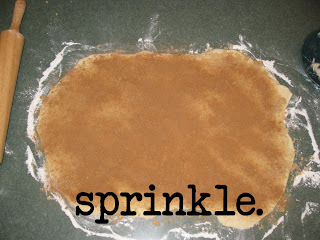 Spread ¼ c. melted butter on top of dough. Sprinkle cinnamon and sugar to heart’s desire (be generous with cinnamon and sugar). 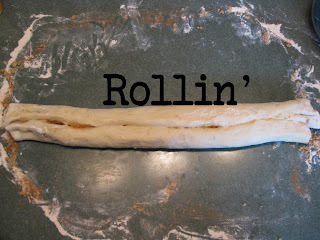 Starting at each long end, roll the dough tightly in a roll toward the center. Pinch the seam shut. Bake for 13-18 minutes at 350 degrees. Frost with your favorite icing tinted with just a drop of red food coloring. We used buttercream icing, but cream cheese is good, too! (click on the frosting names for recipes). Enjoy! Valentines Day is coming and we've been "bitten" by the Love Bug! Well, actually, WE were the ones doing the biting. :) I had a hard time getting a good picture, the kids were eating them too fast! 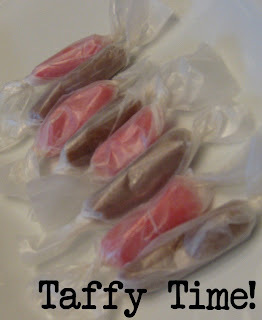 These are a fun after school project, we just used candy from the pantry and let everyone get creative. Have fun! You are basically making "rice krispy treats" for the bug's bodies. We just used a larger cereal for a fun texture. In a large bowl, microwave butter and marshmallows for 3 minutes, stirring after 2 minutes. Add a few drops of red food coloring and stir well. Mix in the breakfast cereal, stir well. Let cool for a minute or two until it is cool enough to handle. Spray hands with cooking spray then take about 1/2 c. mixture and form into a ball. Squeeze it together firmly to retain shape (if it starts to fall apart, wait until mixture cools a little more). Place balls on wax paper or aluminum foil sprayed with cooking spray until cool and completely set. When set, take two circus peanuts, add a dab of frosting to the top, then attach to the ball to make the "feet". Add various candies to decorate your bugs and enjoy the love! I'm still here and still cooking--we've had a week of the family flu and a broken fridge. Ick. We're making "Love Bugs" tomorrow as a Valentine's experiment. We'll see how they turn out! See you soon! It's Groundhog Day time! 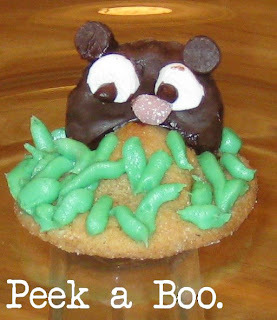 I also have a tutorial on some cute-as-a-button Groundhog Pancakes here. Anyhow...on to more important upcoming holidays, Groundhog Day!! I'm in charge of a "Groundhog's Day Treat" for Big C's school class and this is what I came up with. I'll use sugar cookie dough for the actual event to avoid any peanut allergy problems. Preheat oven to 375 degrees. 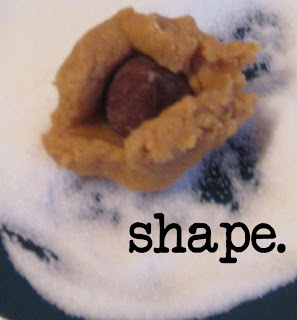 Take a golf-ball sized pinch of cookie dough and flatten slightly in your hand. Place one hershey's kiss in the center of the dough and wrap dough around it, completely covering the hershey's kiss. 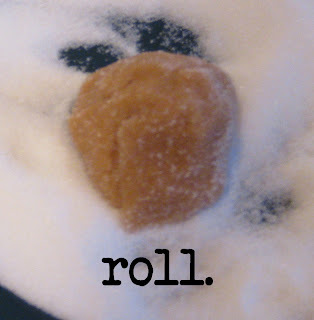 Roll in granulated sugar and place on a greased cookie sheet. 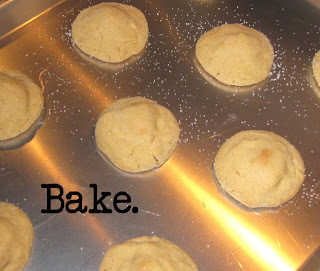 Bake at 375 for 10 minutes, until edges are barely brown and cookies are set. Let cool completely. 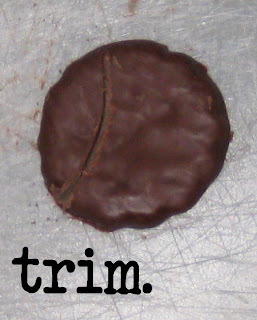 Trim a storebought chocolate cookie slightly on one side and press into cooled cookie. Using scissors, snip off two pieces of a small marshmallow for eyes, adhere to chocolate cookie w/ a little chocolate icing. Add a piece of gumdrop (or whatever) for a nose and two chocolate chips for ears (again using chocolate icing as your "glue"). Add two small drops of chocolate icing for eye pupils. Place green icing in a plastic baggie, snip off one end, and add some "grass" on your cookie. Ask you kids if they saw his shadow as they gobbled him up!